HA NOI (VNS) — The gold price yesterday dropped to its lowest value over the last two weeks, reaching VND36 million (US$1,714) per tael, reported gold sellers. In the opening session, the largest southern gold trader, SJC, sold at VND36.09 million ($1,718) per tael while the buying price was fixed at VND36.03 million ($1,715) per tael. Meanwhile, in the northern market, Bao Tin Minh Chau reported a selling price of VND34.7 million ($1,652) per tael at the start of trading, and this price remained constant until 3pm, marking a decline of VND120,000 ($5.7) from last Friday's session. Several popular traders, such as DOJI Ha Noi, VietinBank Gold and Techcombank Gold, traded gold at around VND36.04 million ($1,716) to VND36.08 million ($1,718) per tael. Compared with last Friday's session, the trading price of gold generally dropped by VND60,000 ($2.85) per tael, making it the lowest trading price within the last two weeks. 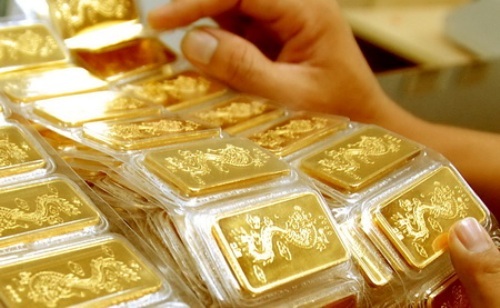 "People chose to buy gold when the price fell to around VND36.1 million ($1,719) and sold it when the price rose to around VND36.3 million ($1,728)," stated a representative from gold trader PNJ.